Photos have appeared online showing Barbara Mahama, the widow of the late Captain Mahama, weeping helplessly. 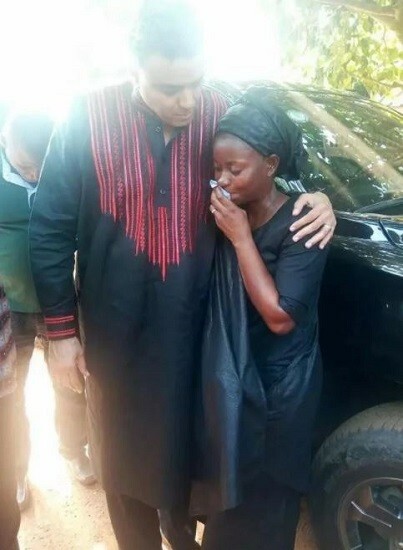 The photos were captured when Bishop Dag Heward-Mills, the founder of the Light House Chapel, called on the family of the late Army officer to sympathize with them on their loss. The photos show Barbara trying but failing to choke back tears, as the shocking loss of the father of her two kids dawned on her. Bishop Heward-Mills had to put his arms around her shoulder and console her before she managed to pull herself together. It is not immediately known if Barbara is a member of the Light House Chapel. It is possible that Bishop Heward-Mills visited her as just an ordinary citizen who was concerned about her welfare. The photos appeared on the same day that the Ghana Police Service released an investigative report on Monday’s killing of Captain Mahama. The report stated that the soldier embarked on a 20-kilometre walk at about 8am that Monday. He reportedly wore civilian clothes and carried a pistol, which he tied to his waist. Police say at about 9:25, when he had walked 10 kilometres, he met some women selling by the side of the road and proceeded to chat with them. He bought snails from one of the women and reached into his pocket for money to pay her. As he did so, he lifted his shirt, exposing the pistol. He then paid the woman and told her that he would pick up the snails on his way back from the walk. Police say, as soon as he left, however, the woman called the assembly man in the area, William Baah, and informed him that she had spotted an armed robber. The assembly man, without trying to find out if the information was accurate, quickly mobilised the people in the community and told them to get ready to go and attack a robber who had been spotted with the gun, the police report said.